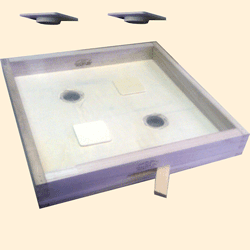 This is our own design, superior alternative for the standard Crown Board. This is a thick strong 9mm board with four 44mm holes. Two holes are screened on both sides with stainless steel 3mm mesh. 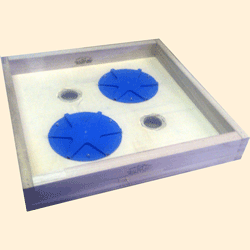 The other two holes are open but can be closed with the two plugs included. There is a bee space on one side of the board and our 45mm Eke which includes a hinged door on the other side. Closing the open holes with the plugs included and opening the door in the Eke allows the board to be used as an upper floor. This enables many swarm control and queen rearing techniques without needing a second hive. The holes meshed on both sides prevent food sharing but still allow the distribution of colony odour and through ventilation. Attaching Clearing Escapes (these are not included) turns the board into a fast clearer board for clearing of bees from honey boxes. Place the board underneath the boxes to be cleared. 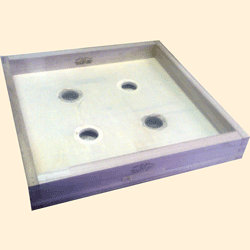 The board is used with the 45mm Eke below. This provides cluster space for the bees coming downwards preventing congestion. Bees trying to go upwards are naturally attracted to the meshed holes which further facilitates rapid clearance.